She soon found out. After joining the team, she spent a year mostly on the practice roster, learning her way around the mast and the mainsail and the jib and the halyard and the bow and the centerboard—and the water. The Charles River, Harvard’s home field, “is a famously shifty venue,” she says. “A lot of people get frustrated with that. The paradigms you expect on the water aren’t there. Or you do something that gets you really far in one race, and the exact same thing puts you last in the next race.” But she found that the river’s unpredictability freed her to make mistakes and recover from them, knowing that a bad race or an upturned boat wasn’t always her fault. 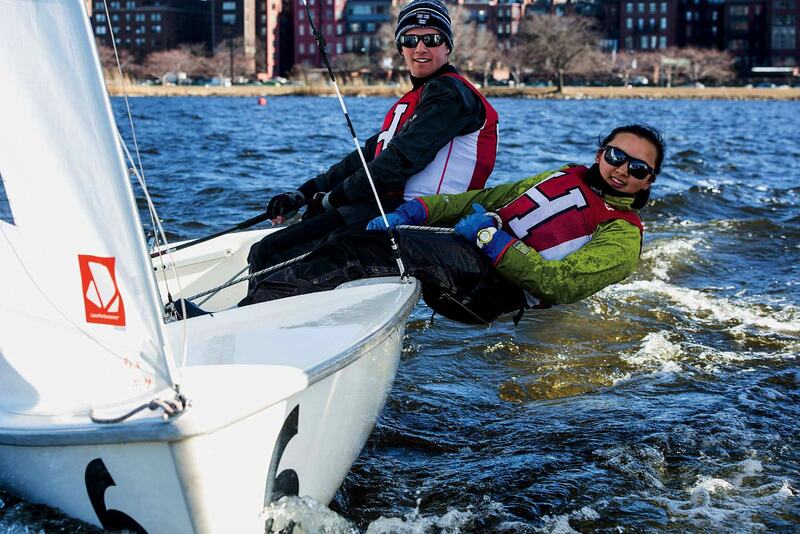 Collegiate sailing is both a spring and a fall sport, and after two semesters as crew to a new skipper each week, Jagdagdorj was paired with Nick Sertl ’18, a skipper who’d been recruited out of high school, who’d led his youth teams to championships, whose mother was an Olympic skier. That year, he and Jagdagdorj took home numerous first-, second-, third-, and fourth-place finishes, helping Harvard to first place in the BU Trophy regatta and runner-up in the Sister Esther regatta in Newport, Rhode Island, plus other top-10 finishes. Then last spring, the two were voted co-captains. In the two-person Flying Junior dinghies that Harvard races, the skipper sits at the stern and controls the rudder and the mainsail, and the crew, in the bow, controls the jib. That barely begins to capture the role, though, says Jagdagdorj. While the skipper reads the wind and makes decisions for the boat—when to tack or jibe, when to ease or trim the sails—the crew is responsible for the countless tiny adjustments that can make the difference between winning and losing. And sometimes not-so-tiny adjustments: “When it’s really, really windy,” she says, “you hike.” That’s when she tucks her feet into the straps at the base of the boat and straightens out nearly parallel to the water, clutching a rope and leaning hard into the wind, with all the weight of her five-foot-two-inch frame, to keep the boat from rolling sideways. “Your thighs are burning, your abs are tight, you’re choking on water, and you’re thinking, ‘Almost there, almost there, 30 seconds, almost there.’ You start saying whatever you need to say to stay in that position. If you come up for even one second, you can lose a whole boat length.” It’s the crew, she says, who has to keep the boat flat. She remembers a race at Tufts that sophomore year, one of the last regattas of the fall, when it began to hail. (“Unless there’s lightning, we race,” she says. “We’ve sailed in snow, in really torrential downpours, in 50-mile-per-hour winds—in zero wind. Sometimes you’re wearing a drysuit and an entire winter outfit underneath it, and you’re still frozen at the end of the day.”) Jagdagdorj and Sertl were doing well, going fast despite the weather. But then, sailing around the last mark to head downwind to the finish, the boat flipped over. And the rudder, which wasn’t tied down, fell out. They got the boat upright, but then they couldn’t steer. Huddled in the hull together, they started to really feel it then: the hail and the cold and the wet. And the lost race. That’s when Jagdagdorj knew she was serious about sailing. She’d seen it at its worst and still came back for more. To her family, this was all somewhat baffling. Born in Ulaanbaatar, Mongolia, she came to the United States with her parents at five years old, when her mother began graduate school in journalism at the University of Missouri (she’s now an instructor there; Jagdagdorj’s father works for IBM). In the early months after Jagdagdorj joined the team, there were worried phone calls from her grandmother back home in Mongolia; her grandparents kept asking if she’d given up sailing yet. She kept having to tell them she hadn’t. Then she had to tell them she’d been named co-captain.